What is your knee telling you? You know that the discomfort in your knee is there to give you a message. That it reflects some imbalance in you or your life. But what exactly is the message? How do you receive it? What language does it speak? Water on the knee – a holding of emotional energy. 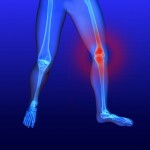 Inflamed knee – something or someone is making us feel irritated or angry. Dislocated knee – a resistance to giving way. These interpretations will give you some clues about your knee’s message. Sometimes they are sufficient to trigger an insight to what’s going on. Other times they feel too vague, or you just can’t relate to them. That’s when you need to move from the general interpretations of knee problems to find out exactly what your knee is saying to you. The best way to discover your knee’s message is to ask it to tell you. Have a conversation with your knee! This may seem strange at first; only because we’re not in the habit of communicating with our bodies. 1. Trick your way past your conscious mind! This question (from NLP) helps bypass all the doubts of your conscious mind, and allow your intuition to speak up. It is surprisingly effective! Accept the first response you receive, however strange it may seem. This is a blend of EFT and the wording used in The One Command. If you’re new to EFT you can use just one tapping point – the knobbly, inner end of your collar bone, at the bottom of your neck. If you know the EFT points, you can move to a new point with each phrase of the sentence below. I don’t know how, I know the message my knee is giving me, I only know I do know now, and I am grateful. Repeat the tapping and repeat the sentence slowly, several times. As you start to feel calmer you open to your intuition, and your knee’s message will come to you. Trust the first message that comes to you, whatever form it takes – words, images, a knowingness etc. If the message isn’t clear, ask for clarification. The Delicious Nugget: The discomfort in your knee has a message for you so you can help yourself to heal. To receive the message you need to access your intuition, relax and be receptive to receiving the message in whatever way it comes. Wow this worked! My knee often acts up, and this time round stiff for two weeks. Yes, Luma, that can be helpful!. And the beauty of accessing your knowingness is you don’t need to use any analytical framework, your knowingness conveys to you exactly what you need to know – and that may be beyond what your brain, or anyone else’s, already knows! Thanks for sharing your experience, Victor. Sounds as if you’re open and willing to find out what’s going on with your knee. Good luck! stoop very low without hearing my knee cracking and wondering if i would be able to stand on my own. This is amazing. I found this site accidentally( or was it ).